1Maitre de conférences, institut d’archéologie, Université Alger2. Rock art represents one of the most important archaeological remains in the Algerian Saharan Atlas. The various classical attempts for its study and interpretation led to the proposal of a methodological framework based on the description and classification of this archaeological record in chronological stages. The spatial distribution of rock art in the landscape as well as the related geographical context required the application of new and innovative approaches such as spatial archaeology and Geographic Information Systems (GIS). The main goals of this paper are to illustrate the impact of the geographic, topographic and the environmental context on these cultural manifestations, as well as to propose behavioral hypotheses based on the analysis of their spatial distributions. یعتبر الفن الصخری من أهم المخلفات الأثریة التی تحظى بها منطقة الأطلس الصحراوی بالجزائر. وقد توصّلت الدراسات التقلیدیة إلى اقتراح منهجیة قائمة على وصف ثمّ تصنیف النقوش والرسومات ووضعها فی إطار کرونولوجی نسبی. إعتمادا على بیانات التوزیع الفضائی و السیاق الجغرافی العام لعیّنة من محطات الفن الصخری بمنطقة الجلفة، حاولنا تطبیق مناهج علمیة حدیثة تعتمد على دمج مقاربات علم الآثار و علم الجغرافیا وتطبیقات نظم المعلومات الجغرافیة. والهدف من هذه الدراسة هو محاولة فهم تأثیرات الإطار الجغرافی و الطبوغرافی و البیئة القدیمة على الإنسان المنتج لهذا الفن الصخری، کما حاولنا اقتراح نموذج سلوکی اقتصادی واجتماعی مرتبط بهذه الظاهرة الثقافیة وتوزیعها الجغرافی. Aumassip G. « Chronologies de l’Art Rupestre Saharien et Nord-africain ». Ed. Jacques Gandini, Calvisson, France, 1993. Bailey G. « Site Catchment Analysis. In Archaeology : The Key concepts». Eds. Renfrew, C. and Bahn, P. London: Routledge, 2005, pp. 172-176. Barge O., Rodier X., Davtian G., Saligny L. « L'Utilisation des Systèmes d'Information Géographique Appliquée à l'Archéologie Française ». Revue d'Archéométrie, n°28, 2004, pp. 15-24. Binford S. R., Binford, L. R. « New Perspectives in Archaeology». Aldine Press, Chicago, 1968. Camps G. « Les Civilisations Préhistoriques de l’Afrique du Nord et du Sahara». Ed. Doin, Paris, 1974. Chibane B., Boutaleb A., Lacroix M. « Etude Hydrochimique et Approche Isotopique en Région Semi-Aride: Cas du Synclinal de Djelfa (Algérie) ». European Journal of Scientific Research 45 (2), 2010, pp. 270-290. Clark P.J., Evans F.C. « Distance to Nearest Neighbour as a Measure of Spatial Relation­ships in Populations ». Ecology, 55, 1954, 445-453. Clarke D-L. « Spatial Information in Archaeology ». In Spatial Archaeology, Ed. by Clarke D.L :1-32. Academic Press, London. 1977. Conolly J., Lake M. « Geographical Information Systems in Archaeology ». Cambridge, Cambridge University Press, 2006. 10.Flamand G. B. M. « Deux Stations Nouvelles de Pierres-Ecrites (Gravures Rupestres) Découvertes dans le Cercle de Djelfa, Sud-Algérois». L’Anthropologie, 25, 1914, pp.433-458. 11.Flamand G.B.M. « Les Pierres Ecrites ». Ed. Masson, Paris 1921. 12.Grebenart, D. « Problèmes du Néolithique près d’Ouled Djellal et Djelfa : Botma Si-Mammar et Safiet bou-Rhenan ». Libyca 18, 1970, pp. 47-66. 13.Hachid M. « La Chronologie Relative des Gravures Rupestres de l'Atlas saharien (Algérie) et la Région de Djelfa ». Libyca, 30-31, 1982-1983, pp.143-164. 14.Harris T. « Geographic Information System Design for Archaeological Site Information Retrieval». Computer Applications and Quantitative Methods in Archaeology, 1986, pp.148-161. 15.Herzog I. « A Review of Case Studies in Archaeological Least-Cost Analysis ». Archeologia e Calcolatori 25, 2014, pp. 223-239. 16.Hietala, H. « Inrasite Spatial Analysis in Archaeology ». Cambridge University Press, Cambridge, 1984. 17.Higgs E.S. et Vita-Finzi С. « Prehistoric Economies: A Territorial Approach ». Ed. HIGGS E.S, In Papers in Economic Prehistory. Cambridge, Cambridge University Press, 1972, pp.27-36. 18.Higgs E.S. « Palaeoeconomy ». Cambridge, Cambridge University Press, 1975. 19.Hodder I., Orton C. « Spatial Analysis in Archaeology». Cambridge University Press, Cambridge, 1976. 20.Huard P., Allard L. « Les Figurations Rupestres de la Région de Djelfa, Sud Algérois ». Libyca, 24, 1976, pp. 67-124. 21.Joliveau T. « La Géographie des SIG: Questions et Débats». Colloque Géomatique et Applications: ”Apport des SIG au Monde de la Recherche”. Université d'Orléans-IRD, 2003. 22.Kaabeche M. « Les Relations Climat-Végétation dans le Bassin du Hodna (Algérie) ». Acta Botanica Gallica, 143(1), 1996, pp.85-94. 23.Lemjidi A., Aouraghe H., Atmani A. « L’Art Rupestre de Figuig et Ich (Maroc oriental): Nouvelles Données ». Journal of Materials and Environmental Science, 7 (10), 2016, pp. 3718-3739. 24.Lhote H. « Les Gravures Rupestres du Sud-Oranais ». Mémoires du C.R.A.P.E. Paris, 1970, 16. 25.Lhote H. « Chronologie de l’Art Rupestre Nord-Africain et Saharien ». L’Anthropologie, 1984, pp. 649-654. 26.Lhote H. « Les Gravures Rupestres de l’Atlas Saharien. Monts des Ouled Naïl et Région de Djelfa ». Office du Parc National du Tassili, Alger, 1984. 27.Lieff S. « Applications of Geographic Information Science in the Archaeological Research of the Fincastle Kill Site (DIOx 5). Alberta Canada and Tel Beth-Shemesh ». Master of Science Thesis, Department of Geography. University of Lethbridge, Alberta, Canada, 2006. 28.Maschner H.D.G. 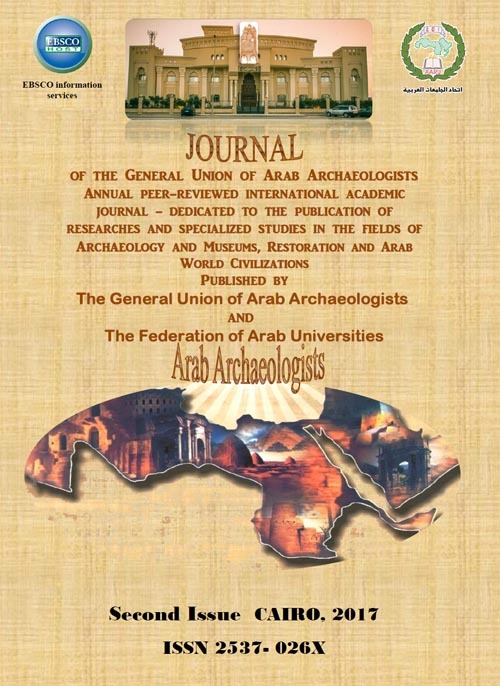 « Geographic Information System in Archaeology. In New Methods, Old Problems: GIS in Modern Archaeological Research ». Ed. Maschner H.D.G:1- 23. Center of Archaeological Investigation. Southern Illinois, University Carbondale, USA, 1996. 29.Mehentel D., Rabhi M., Aberkane K., Bellahreche H., Khalfa A. « Analyse Spatiale Appliquée aux Sites Préhistoriques de l’Holocène dans la Région de Djelfa ». Ed. CRASC/DGRSDT, 2013. 30.Rabhi M., Aberkane K., Belahreche H., Belkacemi S. « Recherches Préhistoriques dans la Région de Amoura (Djelfa, Atlas Saharien Oriental) ». Ikosim 5,2016, pp. 147-156. 31.Roubet C. « Statut de Berger des Communautés Atlasiques Néolithisées du Maghreb Oriental dès 7000 BP ». L’Anthropologie 107, 2003, pp. 393–442. 32.Roubet C., Amara I. « From Art to Context: Holocene Roots of an Initial Neolithic Pastoralism (INP) in the Atlas Ouled Naïl, Algeria ». Quaternary International, 410, A, 2016. 33.Torres J. « Geographical Information Systems (GIS) Modelling in Archaeological Research Contexts ». Geographical Information Science, 25 (1), 2006, pp.1-20. 34.Vaufrey R. « Préhistoire de l'Afrique du Nord : Le Maghreb ». Publication de l’Institut des Hautes-Etudes de Tunis, IV, Masson, Paris, 1955. 35.Vita-Finzi C., Higgs S. « Prehistoric Economy in the Mont Carmel Area of Palestine Site Catchment Analysis ». Proceeding of the Prehistorical Society, 36, 1970. pp.1-37. 36.Weathley D., Gillings M. « Spatial Technology and Archaeology: The Archaeological Application of GIS ». Ed. Taylor & Francis. London, 2002. 37.Zipf, G. K. « Human Behavior and the Principle of Least Effort ». Ed. Hafner, New York, 1965.